After her mother's mysterious death, a young woman is summoned to the floating city of Sky in order to claim a royal inheritance she never knew existed in this award-winning fantasy trilogy from the NYT bestselling author of The Fifth Season. Yeine Darr is an outcast from the barbarian north. But when her mother dies under mysterious circumstances, she is summoned to the majestic city of Sky. There, to her shock, Yeine is named an heiress to the king. But the throne of the Hundred Thousand Kingdoms is not easily won, and Yeine is thrust into a vicious power struggle. 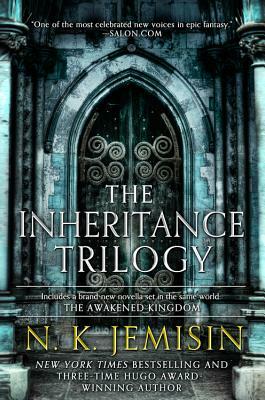 The Inheritance Trilogy omnibus includes the novels: The Hundred Thousand Kingdoms, The Broken Kingdoms, The Kingdom of Gods, and a brand new novella set in the same world: The Awakened Kingdom. N. K. Jemisin is a Brooklyn author who won the Hugo Award for Best Novel for The Fifth Season, which was also a New York Times Notable Book of 2015. She previously won the Locus Award for her first novel, The Hundred Thousand Kingdoms, and her short fiction and novels have been nominated multiple times for Hugo, World Fantasy, Nebula, and RT Reviewers' Choice awards, and shortlisted for the Crawford and the James Tiptree, Jr. awards. She is a science fiction and fantasy reviewer for the New York Times, and you can find her online at nkjemisin.com. "The best book I've ever read."